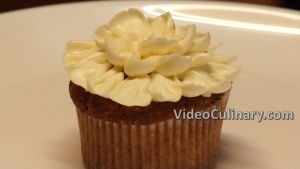 Basic vanilla cupcakes that are easy to make and are moist and delicious! 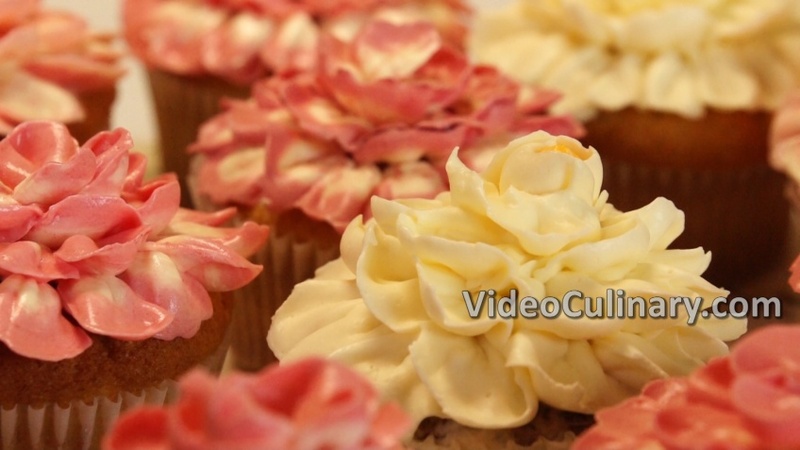 These cupcakes are decorated with colorful white chocolate frosting flowers and roses, and are perfect for parties and birthdays. 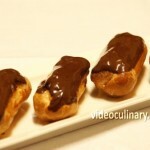 First, make the chocolate ganache. 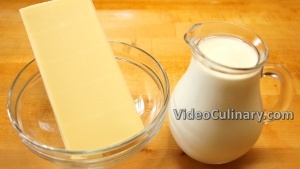 Bring 300 ml (10 fl oz) of cream, of at least 30 % fat to simmer (do not boil). Pour over 200 (7 oz) grams of chopped white chocolate. Let stand for a minute, and stir until smooth. 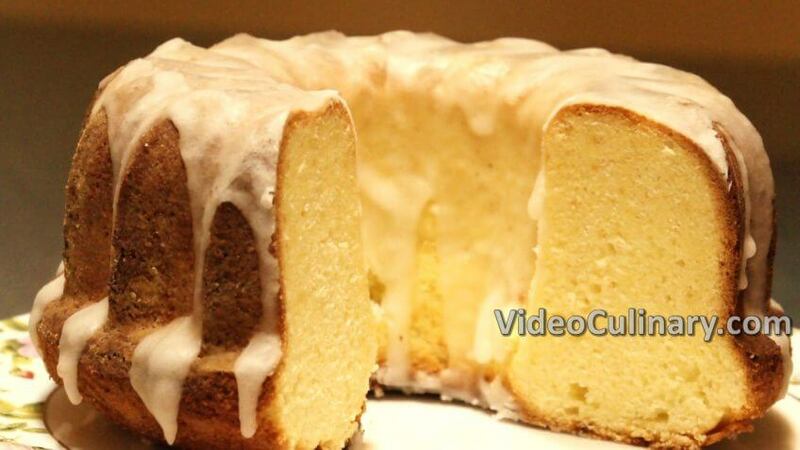 Cool slightly, cover with plastic wrap and place in the fridge for at least 5 hours. 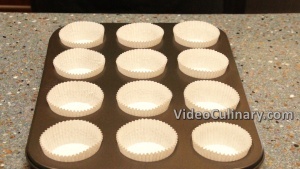 Place 12 cupcake liners (paper cups) in a muffin/cupcake pan. Sift together 220 grams (8 oz) of flour and 5 grams of baking powder. 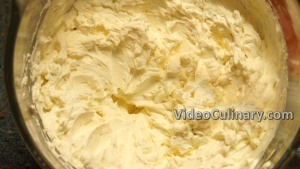 Place 120 grams (4 oz) of soft butter in the bowl of a stand mixer. Whip on medium-high speed until light in color. 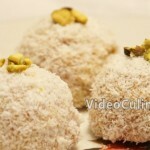 Add 200 grams (7 oz) of sugar and continue whipping for another 2 minutes. Add 2 eggs, one at a time mixing well after each addition. Add a teaspoon of vanilla sugar or extract. 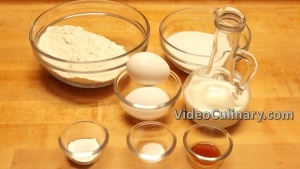 Reduce the speed to low, and alternate adding the sifted flour and 120 ml (4 fl oz) of milk. Mix just until combined. 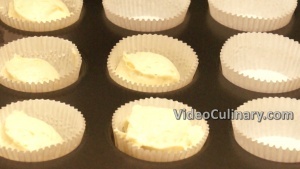 Using a pastry bag, a spoon or an ice cream, scoop the batter into the cupcake liners. Fill about two-thirds full. 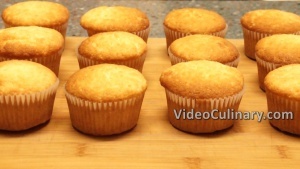 Bake the vanilla cupcakes in a pre-heated oven at 180°C (350°F), for about 20 minutes.Test for doneness – an inserted skewer should come out clean. Cool for a few minutes, unmold and cool completely. These cupcakes are ready to frost and decorate! 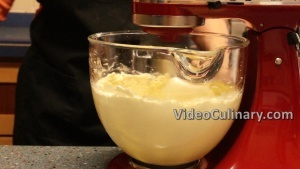 Remove the white chocolate ganache from the fridge, place in the bowl of a stand mixer and whip on high speed until stiff. 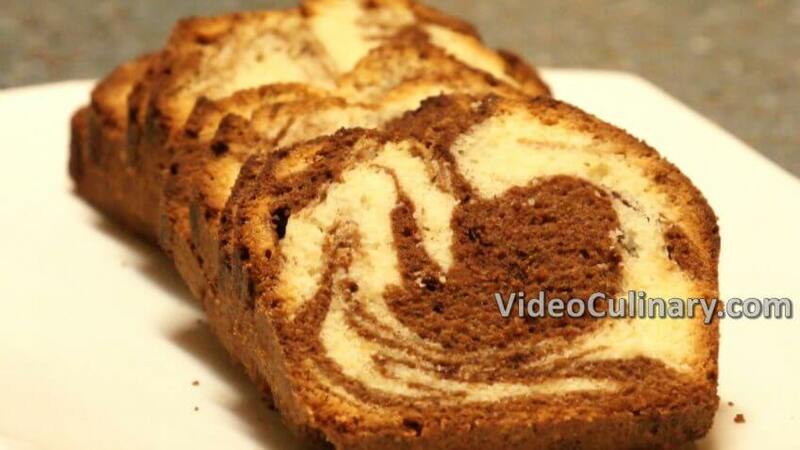 Be careful not to over whip, as the ganache whips very quickly. 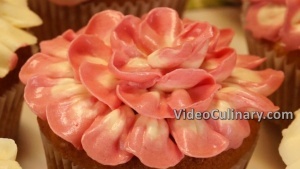 Fit a piping bag with a petal tip, and fill with the white chocolate frosting. 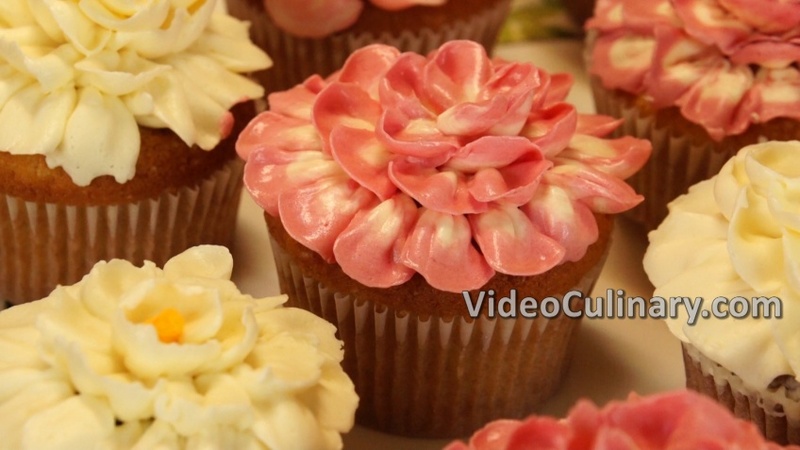 To pipe flowers, hold the bag with the narrow end of the tip pointing out, and pipe petals around the outer edge of the cupcake. Angle the tip up slightly, and pipe a second layer of petals, closer to the center of the cupcake. Pipe a third layer of 3 – 4 petals. You could also make 2 or 3 colored flowers. 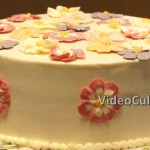 To make colorful flowers, divide the frosting into a few bowls. Color each with a different color. Push each frosting down towards the tip, trying to keep buttercream on one side, leaving space for another color. Squeeze some out until you can see all colors. 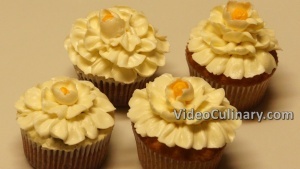 Pipe the flower over your cupcake. 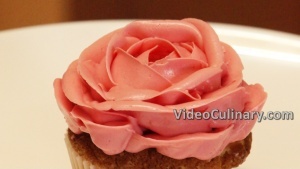 To make a buttercream rose, squeeze out a heavy base of buttercream. 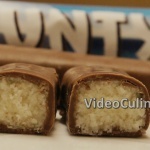 Make a center bud around the base of buttercream, with the wider end of the tip facing down. Pipe overlapping petals, while turning the cupcake and angling the tip further outward as you go, until your rose is full. 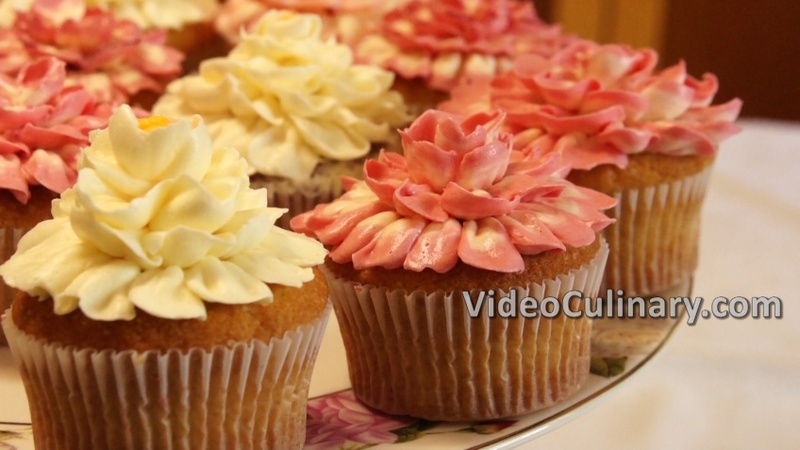 These vanilla Cupcakes are delicious, beautiful and easy, and are great for parties or birthdays. 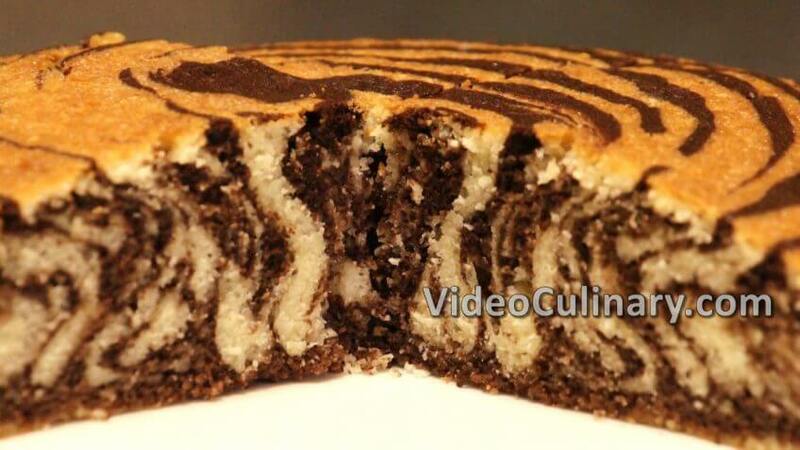 You might like our simple chocolate cake decorated with buttercream flowers, Homemade Snickers bars recipe, and our to make easy Zebra cake. Enjoy!